If you read this blog regularly, you’re very familiar with the things students should do to increase their SAT and ACT scores: create a logical prep timeline, use great prep resources, consider pursuing a course or tutoring, and take full-length practice exams. Sometimes, however, improving scores on the SAT or ACT isn’t about doing something, but about not doing something. This goes especially for the Reading on each of the exams. For many students, the Reading sections on the SAT and ACT are the most troublesome: because reading comprehension skills develop over many years, and because the only thing that improves these skills is reading itself, those students who have never been naturally inclined to read start their prep at a significant disadvantage. Even students whose reading habits were once well developed but have fallen off through the years can find the long, sometimes dense passages tough to get through. For these test-takers, elements like subtle references, extended arguments, and figurative language are difficult to parse, especially under time pressure. The good news is that getting many of the reading questions right doesn’t require exceptional critical reading skills. It turns out that to increase the number of Reading questions they answer correctly, students can actively avoid doing one thing: making assumptions. Humans are creatures of habit and experience. When we encounter scenarios whose details match what we’ve sensed before, we form assumptions about how these situations will play out. Unfortunately, the ACT and SAT prey on students’ tendencies to do so. A perfect example arose on the April 2015 ACT. One of the Reading passages detailed the work of siblings William and Caroline Herschel in the late 1700s. The passage explains that William, an astronomer, enlisted the help of his sister to embark on a telescope-building project. 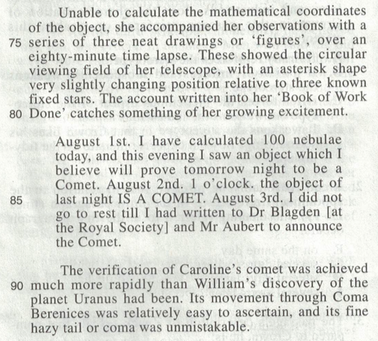 It goes on to focus on Caroline, who, despite her inability to calculate stellar coordinates, was able to discover a comet “much more rapidly” than William had been able to confirm the discovery of the planet Uranus. 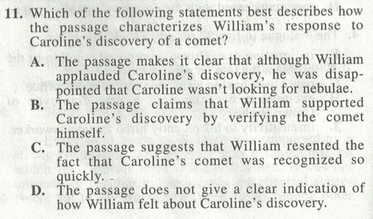 The very first question of the passage asks about William’s “response to Caroline’s discovery of a comet,” providing a wide range of possibilities. Here is the relevant part of the passage, along with the question and its answer choices. When students see this question, they are likely to use their experience and personal biases as a jumping off point. How easy is it to think about sibling rivalry and feelings of jealousy and annoyance in the context of a sister with less experience achieving a great discovery more quickly than her more seasoned brother? How easy, therefore, is it to pick choice C? The problem is that the passage never says anything about William’s feelings about Caroline’s discovery. When students read the line about Caroline’s findings occurring “much more rapidly” than her brother’s, and then assign to that line a judgment of their own, they are falling right into the trap that so many of these Reading questions set. But great news: there’s an easy way out –– stop assuming! Before committing to choice C, students should ask themselves where evidence of resentment shows up. In doing so, they must set the bar of proof very high. Does the passage ever say that William felt sourness toward his sister, or are we assuming that friction exists simply because the passage compared the rapidity of their discoveries? Stopping the assumption in its tracks and replacing it with the most basic line of questioning does the trick: there is zero concrete evidence for answer choice C, and we can move on to the other choices. 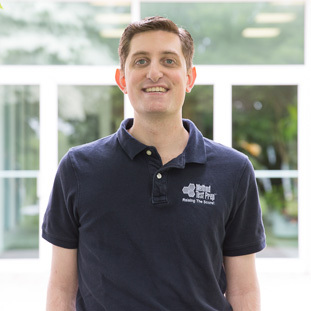 A message, then, to all students who struggle with the Reading passages on the SAT or ACT: try to be conscious of your own assumptions, and question whether they are actually evidenced by the passage; you’ll be surprised by how many answer choices you can eliminate, and how many more questions you can answer correctly as a result.